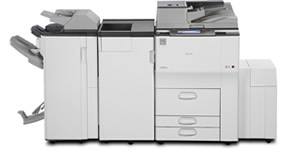 The new Ricoh Aficio MP7502 provides you with a powerful all in one system that offers the very best in performance with top quality results that demonstrate Ricoh's continued development and dominance in this market segment. The Ricoh Aficio MP7502 handles any document workflow/strategy task thrown at it with exceptional ease and gets the job done in a quick and secure manner. The Ricoh Aficio MP7502 offers the following features.